Schools of Hope volunteer tutor Theresa Smet works with a student at Waller Elementary School last year as part of the United Way partnership with the Burlington Area School District. The program is looking for additional volunteers for this school year. Former Burlington Area School District Assistant Superintendent Patricia Hoffman has been volunteering her time as a reading tutor for students at Waller Elementary School. 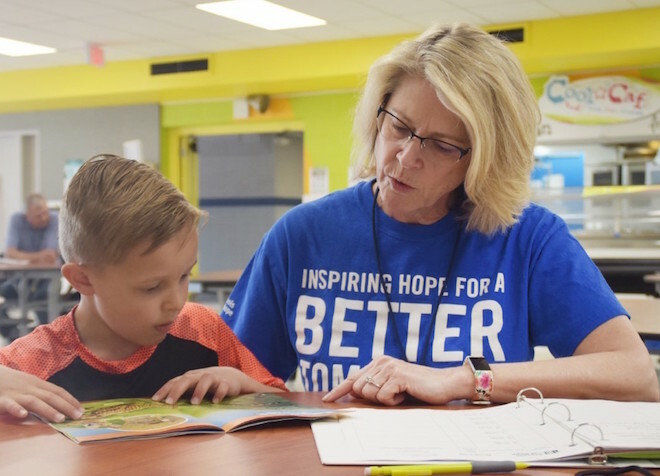 Hoffman shares her expertise with first- and second-grade students as part of the Schools of Hope program sponsored by the United Way of Racine County. BASD welcomed Schools of Hope into the district a year ago, starting with Waller, by bringing volunteers in to tutor young students three times a week. Last year, Schools of Hope had 16 students involved in the program and 25 volunteers, garnering over 400 hours across 900 sessions. Starting in 2012 at two schools in the Racine Unified School District, the program expanded into Burlington as a way to reach more students. Jessica Safransky Schacht, the Education Initiatives Director for United Way of Racine County and Schools of Hope tutor, helped move the program into the Burlington School District by working with Superintendent Peter Smet to find the most suitable place for the program to begin. The goal of Schools of Hope is for each student to receive three sessions a week, three different times throughout the week, with volunteers committing to one hour per week. To read the entire story see the Sept. 6 edition of the Burlington Standard Press.